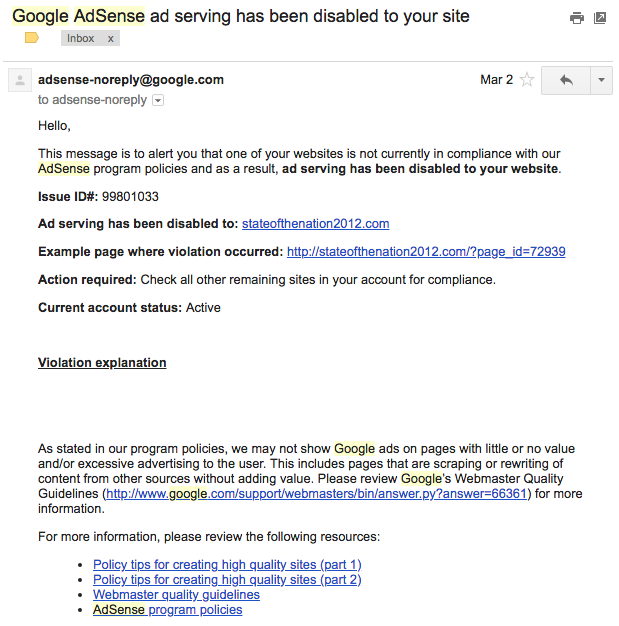 As incredible as it may sound, Google actually disabled AdSense on the SOTN website for posting our own articles. This occurred on March 2, 2017 as seen in the email screen-capture posted below. Let’s try that again: the StateoftheNation.com website was penalized for publishing an article originally written by SOTN. The Google email sent to SOTN (see the following screenshot) makes clear that the alleged offense to their program policies was “scraping”, which never occurred. How, pray tell, can SOTN be in violation by posting our own content. This is absurd and unlawful. It’s also in violation of Google AdSense policy, as well as a flagrant form of censorship. significantly, this particular article was originally posted at SOTN. However, what Google was really telling SOTN is that we will outright censor your Alt Media website whenever the nature of the content is too politically sensitive, factually scandalous or criminally radioactive. Now, here is the specific link that SOTN was cited for: http://stateofthenation2012.com/?page_id=72939 as seen in the Google email sent to us on Thursday, March 2. The title of that article is: PEDOGATE: Pandora’s Box Has Been Opened for Deep State and the C.I.A. The subtitle of the same post: P E D O G A T E: A Global Child Trafficking and Exploitation Crime Syndicate. It’s true that SOTN was one of the first websites on the Internet to zealously disseminate the memes Pedogate and Pizzagate. Quite obviously, Google became well aware of this reality very early on during our worldwide multi-media campaign to mainstream Pizzagate and Pedogate, which we did quite successfully. This carefully crafted plan of disclosure was executed during the month of November 2016, especially during the first week leading up to the election. In other words, the Russians really had nothing to do with Hillary’s epic defeat; rather, it was Pizzagate that guaranteed Donald Trump’s victory. Google’s AI brain also knows that SOTN designed a deliberate series of sub-memes regarding the various Pedogate child exploitation crime syndicates. As a matter of historical fact, SOTN purposefully created the following tagline which has since been used by hundreds of websites around the world to bring instant understanding to the two different, yet very similar, child exploitation scandals that destroyed Clinton’s candidacy. What’s the critical point here. Google, LLC possesses a highly advanced content monitoring mechanism which is able to determine the thought leaders and major influencers on the Internet. If your site has been identified as a conservative thought leader that initiates viral Internet campaigns, devises new memes and influences many other Alt Media sites, you are targeted in ways that only Google can target your web-based business and/or website(s). This premeditated and malicious IT process utilized by Google is especially operative when your website has been categorized as Alt Right. Conversely, if your site is labelled a Mainstream Media website or is an affiliated news outlet, you are given free rein to post away your ultra-liberal content with wanton abandon … without any fear of being blacklisted or downgraded or censored or shadow-banned in any way. Facebook, Twitter, Instagram, YouTube, as well as other major social media platforms, also use similar techniques but not the way that all-powerful Google can get away with. For when your site gets on Google’s wrong side, your content is effectively buried on the last pages of a Google search…if you’re lucky! When our previously referenced original article on Pedogate was first posted, it was picked up by everyone. SOTN viralized it in a manner that only our network can do. Quite predictably the article rose to the top of the first page of a Google search when the search term was typed “pedogate”. Today — July 14, 2018 — you can’t even find the article in a Google search. Now that’s some very serious censorship! The actual story is really much more complicated and certainly longer than what has been presented here thus far. But hopefully everyone in the Alt Media will get the gist of it. And especially the utter seriousness of Google’s ongoing violation of the 1st Amendment (which sometimes constitutes both civil and criminal conduct). They really believe that can act with such impunity whereby they can unilaterally remove the AdSense ad delivery network from conservative-leaning sites even for posting their own content. It’s not just SOTN or TMR or other affiliates that are getting systematically censored like this, all of us are to varying degrees. That’s why this legal action is proceeding as a class action suit. Ever since SOTN reported on the transparent censorship by Google, many other sites have complained of similar experiences. Or, they have suffered censorship that’s even more obvious and offensive to the laws of the land. We invite each and every website that has been a victim of Google’s well established predatory censorship policies to send us an email. No need to send reams of hard evidence or volumes of documentation at this time since our legal team is still taking shape. This lawsuit initiative is quite massive. The necessary legal work will begin in earnest when a sufficient number of conservative attorneys have either volunteered their services on a pro bono basis…or have agreed to join on a contingency basis. “Freedom of Speech”, the greater the likelihood of winning this $100 billion class action lawsuit. The only way to realistically protect the First Amendment is to directly confront any and all major challenges to it. Yes, this battle is a classic “David and Goliath” contest, in this case “Alt Media vs. Google”; nevertheless, it MUST BE FOUGHT sooner or later. Most importantly, however, is the absolute necessity of having Google (and Facebook, Twitter, Instagram, etc.) legally and corporately reclassified as social media utilities. For only in this way will the proper oversight be exerted in order to immediately terminate the naked censorship that these MSM behemoths methodically employ. 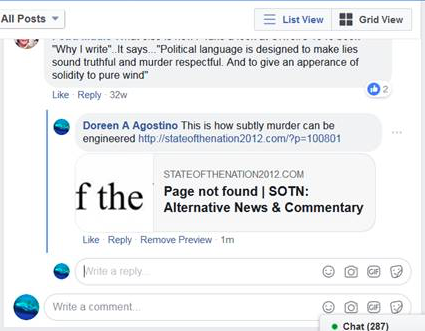 As a matter of fact, we just received the following screenshot from one of our loyal visitors this week indicating that Facebook would not allow SOTN posts on their platform. The crucial point is that Google attempted to coerce SOTN into taking down what is perhaps the single most important exposé ever written and published by StateoftheNation2012. Exactly who has the power to compel Google to perpetrate such a reckless act of blatant censorship. Just how deep has Deep State penetrated Google, Facebook, Twitter, etc. … or were they just all created by the CIA’s Mockingbird Media operation in collaboration with DARPA. Irrespective of precisely who the corporate criminals really are, they must be held accountable… and sooner than later. The overwhelming influence that Deep State now exerts over global media is such that there will soon be a worldwide lockdown. Any website that dares to publish the truth will be summarily blacklisted forever in the not-too-distant future. Some countries are even passing legislation that imposes various civil penalties and criminal punishments for posting raw truth. Any site owner that wants to join this class action lawsuit can do so by sending us their intention to the following email: CensorshipLawsuit@gmail.com. Please be aware that this legal process is in a rudimentary stage of development. SOTN is setting up a dedicated website that will be used to keep fellow plaintiffs apprised of all major developments. Because of competing time demands we are unable to respond to the many inquiries which always follow in the wake of these types of legal initiatives. As more attorneys climb on board this censorship litigation train, we will be able to offer a response to each potential litigant. Thanks to everyone who has the courage and intestinal fortitude to weather this class action suit process. They are always challenging and purposefully drawn out by the defendants throughout the period of the proceedings. Even after the final rulings are rendered they are usually challenged and appealed. Nonetheless, when such un-American censorship becomes institutionalized it must be addressed by people of conscience and websites that post the truth. Is that you? Are your site readers and viewers ardently seeking the truth? If the answer is yes, then it’s time for all of us “Davids” to sling our shots at every “Goliath” on the Internet battlefield today. To neglect to do so will put all of our truth-posting platforms in great peril. It’s quite telling that Google chose the highly revelatory “Pedogate” article to use to illegally shut down our much-needed AdSense revenue. Since we have never asked for donations on our sites, we heavily relied on AdSense to stay financially solvent. It has been an extraordinary struggle to simply maintain our many sites since they cut off all of our revenues. Were it not for a single benefactor, all of our websites would have been closed down over a year ago. For anyone who is inclined to provide financial aid to this cause, please feel free to PayPal a donation to: CensorshipLawsuit@gmail.com.